These canoes were designed for historical hunting, trekking and spirited paddling. 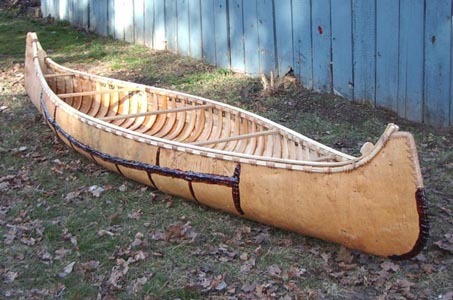 They have the look and in some cases even the feel of a genuine birch bark canoe yet require less maintenance. They are fast and easy to paddle and depending on length weigh from 45 to 75 pounds. As a result they are easy to load on top of a vehicle and portage. On the left is a genuine birchbark canoe. On the right is a hybrid fiberglass replica. 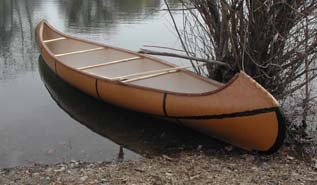 Not everyone lives in an area conducive to the birchbark canoe - too hot or dry. Some want a canoe with the look of the birchbark canoe that can be banged around, left in the yard, taken hunting or fishing or ricing at a reasonable price. 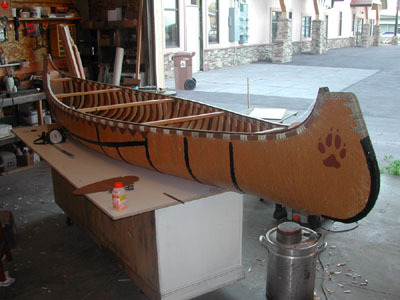 Others want the look and feel of a birchbark canoe both inside and out that can be used in re-enacting. With that in mind we do two types in a few different designs. (Click on the photo and go to the respective web page. At left is our "Hybrid" canoe with wooden ribs and sheathing. On the right is the "Basic" lay-up model. Each comes in any of the three different styles. Give us a call or send us an e-mail. We will be glad to answer questions, get you additional information and photos or take your order. Payment can be made via check, money order or credit card. For your protection we do credit card payments over the phone, not via e-mail.